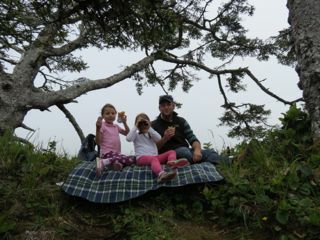 We were going to visit an island to watch the whales and have a picnic today. 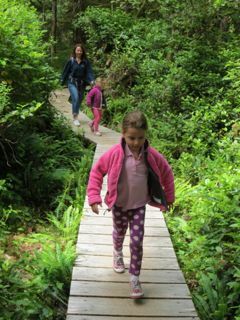 We drove to Schooners Trail and walked along the boardwalk through the rainforest. 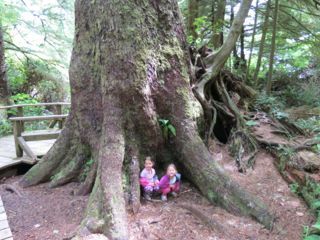 We found lots of big trees (but no rainforest monkeys, to the disappointment of the girls but we did point out we were on the wrong continent for those!) We were on the look out for the special Banana slugs that are an inhabitant of the forests, but no sign of those either. The trees here are different to Yosemite in that over time they break down (the ones in Yosemite don’t as they taste too bitter for the insects to eat!) 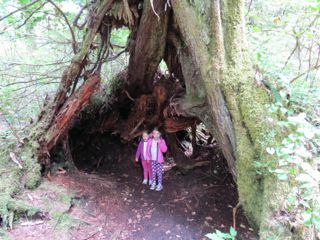 and other trees grow on top of the fallen trees, making for a mishmash of roots, old trees and new trees which is amazing. should be called Paradise Island and it was the perfect place to have lunch! 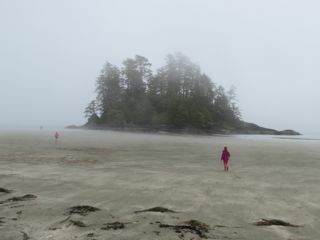 We wandered back along the beach after lunch (which the girls didn’t eat – too busy looking out for pirates and trespassers!) and the Big One built a wooden structure out of bits of drift wood. 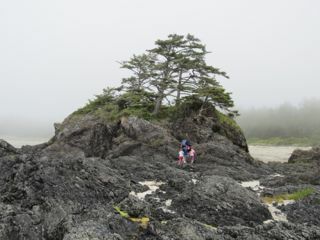 She also found a piece of driftwood that looked like a baby seal, which we will be bringing home. 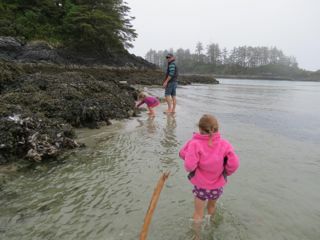 The tide was coming in by now so we had to paddle across to it. 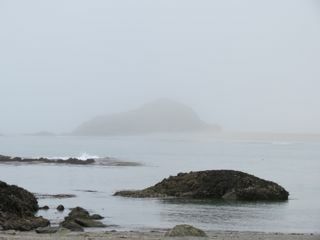 But the exploring was short – the volcanic rock was not a comfortable climb. 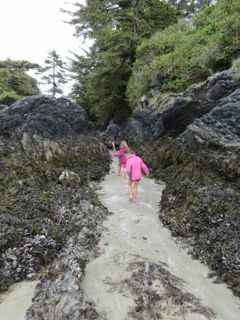 Once the sand ran out we had to turn back. 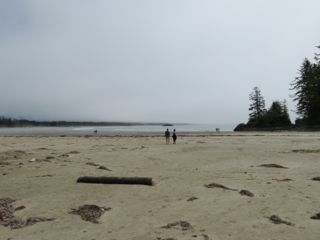 Also, the tide was coming in fast and getting too close to our shoes left on the beach. We did see some of the largest mussels we’d ever seen though – as big as my hand!